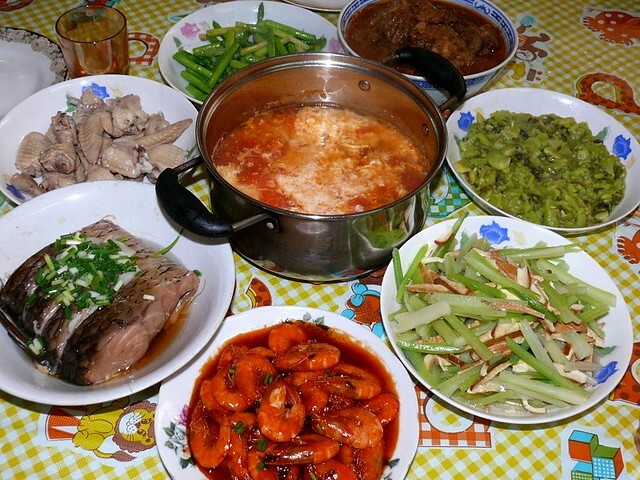 From 12 O'clock: stir-fried asparagus, curry chicken, stir-fried broad beans with xue cai, stir-fried celery with hard bean curd, tomato sauce prawns, Shanghainese-style steamed fish (with wine) and drunken chicken wings. Soup was tomato egg flower soup. One late morning, we were on our way out when Da Ma waylaid us. She insisted that we eat lunch at home and I willingly agreed because I was tired of eating out. Da Ma's maid was a little flustered because she had already prepared lunch for Da Ma. Before we could stop her, she went out and came back (that's the wonderful thing about living in the city. There's always a corner grocery store) with a small bag of live prawns. 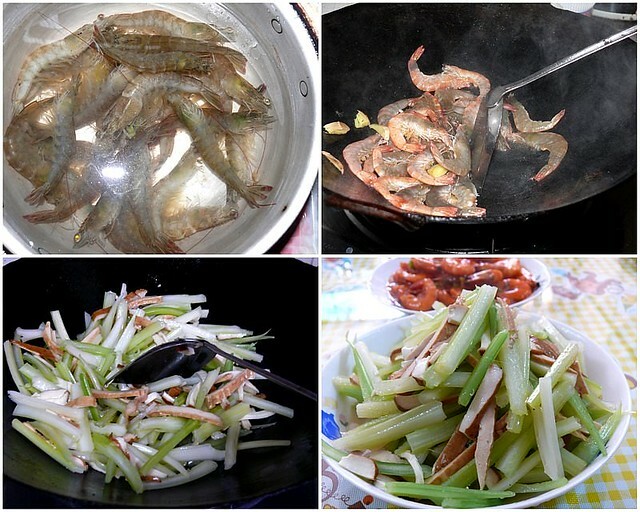 She trimmed them live and threw them into a hot wok and cooked a simple delicious dish of tomato sauce prawns. Lunch was 8 dishes and again I was so full I was upset with myself for gorging. 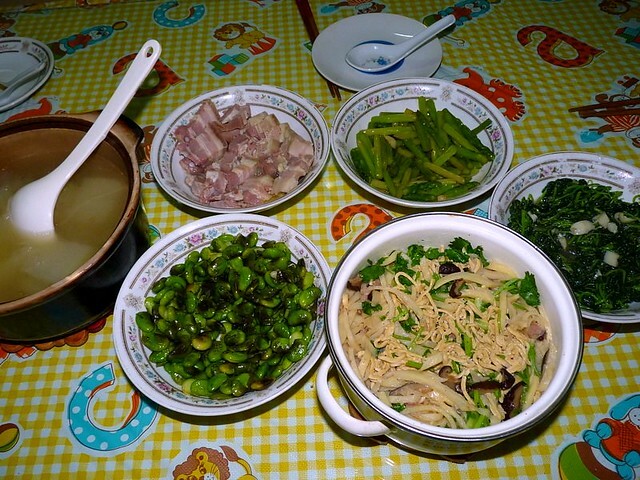 From top: salted pork slices, stir-fried asparagus, stir-fried Chinese spinach sprouts, a beancurd, mushroom and ham stew (gunzi tang) and stir-fried mao doe (fresh soy beans). Soup was winter melon and pork bones. On another day, we were again caught on the way out (the rare day when we didn't have a lunch appointment) so we had lunch with Da Ma again. Since this was really impromptu, Da Ma's maid didn't add more dishes and yet I enjoyed this meal. It made me re-think my meals at home, especially since my Hub is testing a bit high on his sugar levels now. A meal of mostly veggies (many kinds of them) with little carbs (like I said, not eating rice is a trend now) is so much more healthier than my meat-oriented meals. It's an eye and mind opener. I really should not plan my meals around meat, at least not for lunch. Ooji (means turtle in Shanghainese) shen (shoot, sprout) is the veg on the left next to the long beans, with leaves like romaine lettuce. 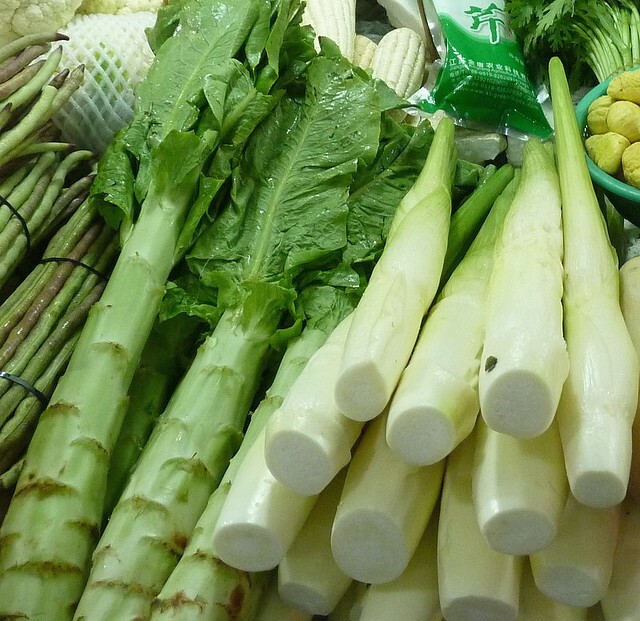 The veg on the right is gaobak. 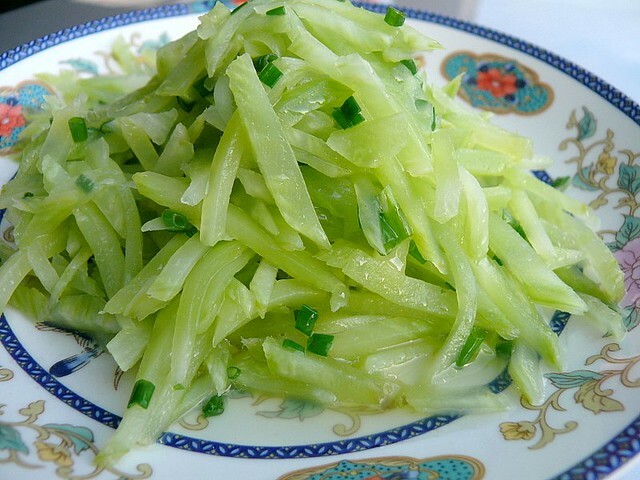 The Shanghainese call this veg ooji shen . In Malaysia, we get them in cans pickled in a light soy sauce which makes them salty and crunchy, perfect for eating with plain rice congee. If you ever find fresh ooji shen in your local market (or bring it back from Shanghai like I did), get a stem and make a cold salad of it. The stems are crunchy and have a slight pleasant scent. 1. Peel the stem, removing all hard fibers. Cut into thin slices, then julienne strips and add just enough salt to taste. Do not add too much salt because it's not washed away. Cover and leave about 20 minutes. 2. Squeeze the salted lettuce stem strips gently, discarding the liquid. Put into a serving bowl or plate, mix in a dash or two of msg and spring onions. 3. Heat the oil until smoking and pour it over the lettuce stem strips, mixing well. You can serve straightaway or chill it prior to serving. Note: Healthy though the dishes were, I was shocked by the amount of msg Da Ma's maid added to each dish. If there's msg in home-cooking, restaurant food must be 100% msg-laced. I suspect the same in Japanese cooking, except that msg is disguised in dashi granules, a quintessential ingredient in Japanese dishes, said to be made of tuna but is really tuna and msg. this particular post..that mushrooms and ham stew sounds really good. mind telling whats exactly in it and perhaps share some recipe tips on it? Hi there. I read your blog a lot and was reading the blog you put in your Tell Box last friday. It doesn't seem to be there anymore! Hope she's ok.
yokee: tq. i've not cooked the gunzi stew b4 but seen my MIl did it: boil a thick pork bones stock with chinese ham, take the bones out, add the gunzi (strips of firm beancurd), mushrooms and winter bamboo if available. try making it! anon: tq for telling me! thanks a lot terri ! Are you supposed to eat the shells of tomato sauce prawns? I was served this dish at a party once but it was served as finger food and was delicious but really messy trying to remove the shells. Everyone did it, so I just followed suit, but I ws wondering what is the correct way to eat them?